Assistant coach Marc Crawford will take over behind the bench on an interim basis. 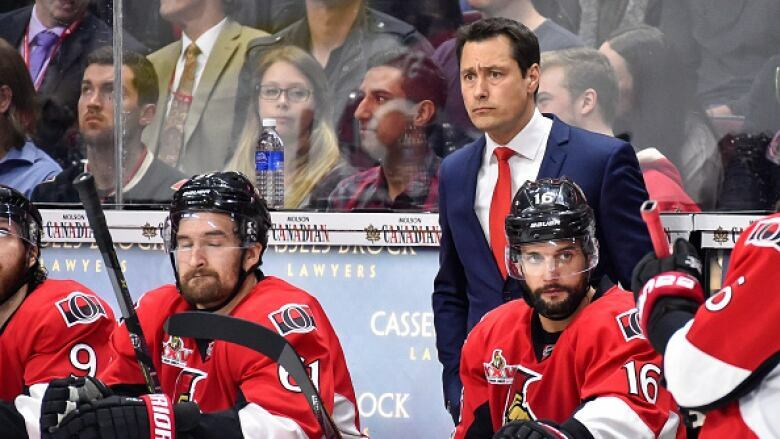 Boucher came on board in 2016, and led the team to the Eastern Conference Finals in his first season as head coach. "We just felt as recently as probably this morning that Guy wasn't going to be our coach moving forward, and we felt for both parties it was time to move on, and obviously we made a decision," Dorion told reporters during a late-morning news conference. Things have gone downhill for the Senators: the team has unloaded their captain and top scorers, and currently sit at the bottom of the league as they enter what management calls a rebuilding period. "I think in this rebuild, playing the kids is crucial. The development of our young players is essential to having this team have success moving forward," Dorion said. Crawford will be the seventh coach the Senators have had since 2007. The litany of bad news came to a head this week with news that a plan to move the team's arena downtown was dead, stirring further frustration among fans with owner Eugene Melnyk. Boucher was in the final year of a three-year contract with the team. Dorion said a comprehensive search for a new head coach will happen once the season ends. "We're going to do a very extensive search. We did it last time. We have an idea of the direction we want to go in. I think a communicator is very important, someone who listens, a teacher, someone who has structure, and someone that can really expedite this rebuild as quickly as possible," he told reporters. Marc Crawford is a veteran NHL coach who won a Stanley Cup with the Colorado Avalanche. He's also coached in Vancouver, Los Angeles and Dallas. "We really do have a great group of players. Yeah, we're not showing it in the standings, but they're a group that cares for one another," Crawford said during the news conference. "They're a group that emotionally is as good as any Stanley Cup team I've been around." Crawford also confirmed that former Senator Chris Kelly has been added to the Senators coaching staff. He had been part of the team's development staff since the start of the season. People responded quickly to the news on social media, with many placing the blame on Melnyk.